She’s a fashion designer, a businesswoman, a model, and a mother of four, so it’s safe to assume that Victoria Beckham is a master in the art of multitasking. On her visit to the Condé Nast College of Fashion & Design in London yesterday, she had the chance to display that skill. 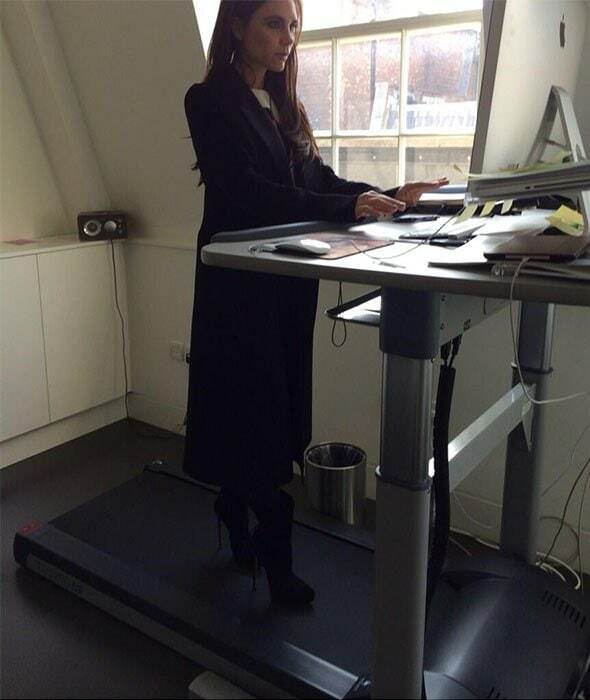 Victoria found a treadmill attached to a computer desk, which she eagerly tried out even though she was wearing boots with nearly 7-inch-high stiletto heels. This wasn’t the first time Victoria Beckham did something potentially dangerous in high heels. If you recall, she climbed a stepladder and decorated a Christmas tree in a pair of 6-inch-high Casadei blade pumps. 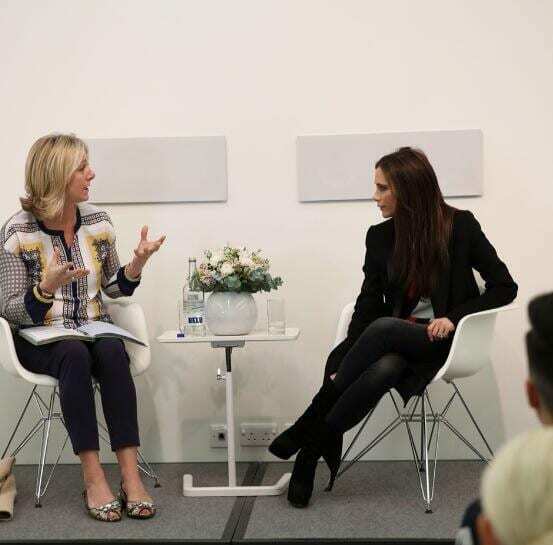 Victoria Beckham’s main purpose for visiting the Condé Nast College was to speak to students about her career and life as a fashion designer, a mom, and a wife. Below is a picture of her with Susie Forbes, the principal of Condé Nast College. Victoria also recently became a supporter of Girl Scouts of the USA and Leanin.org’s campaign to ban the use of the word “bossy” in describing girls. Along with other spokespersons like Beyonce, Jennifer Garner, and Condoleezza Rice, Victoria hopes to inspire young girls to speak up, to lead, and to aspire for great things without fear of being typecast as rude or aggressive. Victoria Beckham was able to squeeze in some exercise time in her busy work schedule in these Casadei platform booties. Victoria is so famously used to wearing high heels that we bet these platform and stiletto booties feel like regular sneakers to her. Would you work out in high heels like Victoria Beckham? Let us know by leaving a comment below!